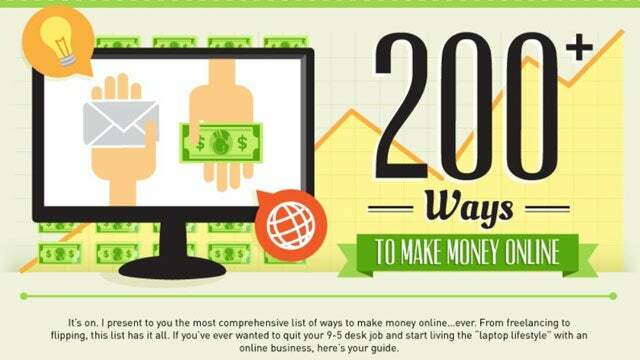 There are tons of ways to make money online, in your spare time and maybewith very little effort. From freelancing to flipping sites, this infographic covers the major resources that can help you put more money in your bank account. The 200+ resources compiled by SurveySpencer.com include sites where you can earn money: freelancing (as a writer, designer, programmer, etc. ), recommending products (affiliate marketing and CPA or cost-per-action marketing), adding content to network sites, creating videos, and flipping your web properties. Perhaps this will jump start some ideas for your online money-making future. Check out Survey Spencer’s post for descriptions of each resource and type of online business. Previous PostHave You Said These 6 Things About Your Credit Card Recently?Next PostBillionaire Jack Ma, the founder and ex-CEO of Alibaba Group, as well as one of the most successful Chinese Internet entrepreneurs, shares his wealth of experiences.